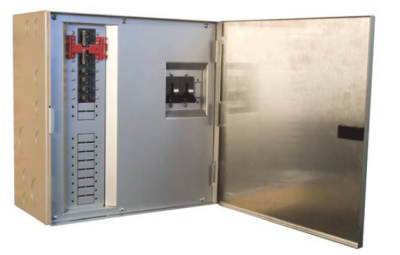 The GSLC175-AC-120/240 is a balance-of-systems enclosure intended to work with the Radian Series (GS) inverter/chargers, FLEXmax Charge Controllers, and OutBack HUB Communications Manager used in AC Coupling systems. GSLC175-AC-120/240 - GS Load Center factory pre-wired for AC-Coupled Applications, with inverter DC over-current protection and disconnect, dual AC inputs, grid-tie inverter connection and 120/240 VAC maintenance bypass. 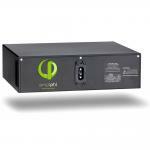 For use with the Radian GS8048 inverter/charger to provide backup power for grid-tie systems with up to 6kW of AC-Coupled PV input. GSLC - This is a basic or "empty" version of the GSLC, recommended for custom-built or large scale systems. One GSLC per inverter. GSLC175-120/240 - Factory prepared with dual 175ADC inverter breakers, dual AC inputs and AC maintenance bypass. Ideal for systems with a single Radian inverter and an AC power source but can be customized in other ways. GSLC175PV-120/240 - Factory prepared with dual 175ADC inverter breakers, dual AC inputs, AC maintenance bypass, PV GFDI, and two PV array inputs, FLEXnet DC battery monitor and three shunts. 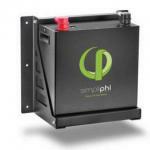 “Plug and play” for systems which have a single Radian inverter and two charge controllers and need battery monitoring. The GSLC175-PV-120/240 is the "fully loaded" version of the GS Load Center. It has all components already present and needs only to have external wiring and devices added. Two 500A 50mV DC shunts are included. Holds up to eighteen 0.75"(19mm) wide breakers, two 1.5"(39 mm) wide breakers (included) and one FLEXnet DC (included). Support for optional AC Input-Output-Bypass Assembly. AC breakers are rated from 10-60 amps of AC current. New double pole 50 amp breaker is available to support 120/240V input and loads.